that have their big national day in the dead of winter??? but also of the shackles of whatever country they wanted to be rid of. so it must be a cracking national day in my book. Oh my...I now wish I hadn't pushed myself out of my comfort zone and posted to the APR, especially after seeing your tea bottles Trace. They're amazing! I heard that Brisbane was colder than Melbourne last night...I hope you kept cosy wherever you are. beautiful bottles! The fourth was good - lots of blue and white! Love your paintings/sketches and comments as always. There is no correlation between independence and hot dogs - It just gives us grown ups the opportunity to eat unhealthy but yummy food! 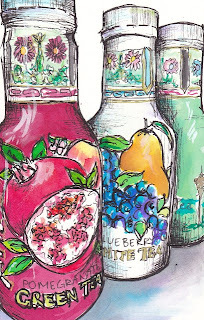 I love it when you paint these beautiful bottles- gorgeous as always and what a fun take on patriotism! I almost bought some of this tea last week when I saw the beautiful bottles, and Thot of the beautiful paintings you do of them. But I remember you mention their addictive nature and thougt it might be the last thing I need, one more thing to be addicted to. (we do manage to have a perfectly good fourth without hot dogs! Yuck! )happy PPF on Thursday. I thought of you at the store the other day when I bought one of these. Well not exactly one of these, because it was a can and not a bottle...but it had PURPLE, and I wished I could paint it like you could! Totally wonderful! Dodgy?? are you kidding?? Sorry to hear you fell off your self imposed wagon but hey, if you're gonna drink something, might as well be something as delicious as Arizona tea!! goodness your sketches/paintings, ART, is awesome! I love your style. Very talented! 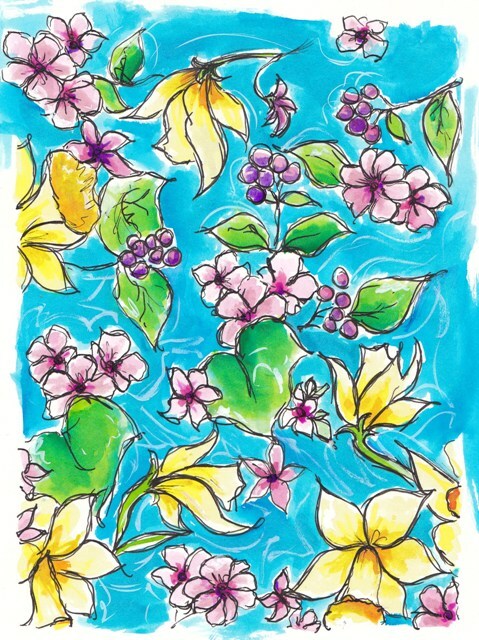 I think Arizona Iced Tea needs to buy your art for their labels. Seriously excellent! 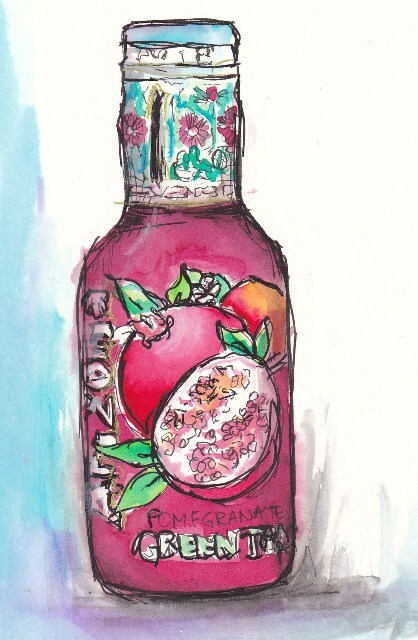 Arizona tea is soooo delicious and I am sure because it comes in pretty bottles that it can't be bad for you! I love to see your imagination run "hog wild" in your posts! So much fun to read and say in my head, yeah, yeah! You go girl! 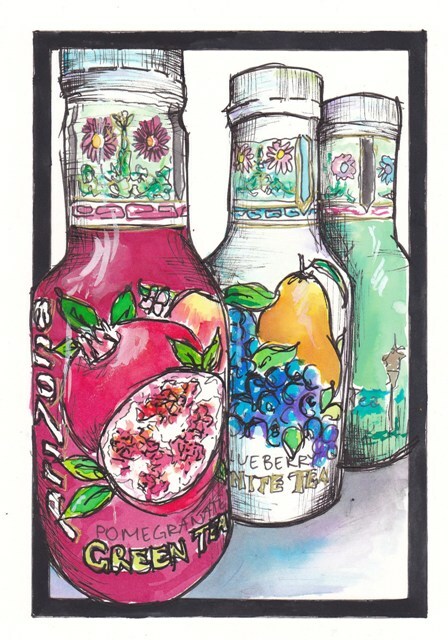 I love Arizona tea and I love your sketches, the colours are gorgeous! I'm screaming down the blog phone here Tracey, WOW WOW WOW what fantastic drawings and story. I wanted to read but I wanted look at the pictures too all at the same time. Wonderful. Well done. Another great, witty and yet informative post from you today! I love how no matter the subject matter or the occasion you can link tea in there somewhere - how you did it with the red, white and blue was pretty ingenious,actually! Beautiful illustrations as always. As always, your artwork complements your writing and viceversa. The bottle colors you chose look great together, and it's a very creative take on the challenge. Blessings! We have that tea here and I have never tried it!! Thanks for the nice comments about Canada! We are extremely patriotic and celebrate in a big way.... concerts, fireworks good food! Everyone wears red, even those who don't like the color. Some, like me, fly the Canadian flag on our cars! This year I stayed home...but I have many amazing memories... as does my daughter! 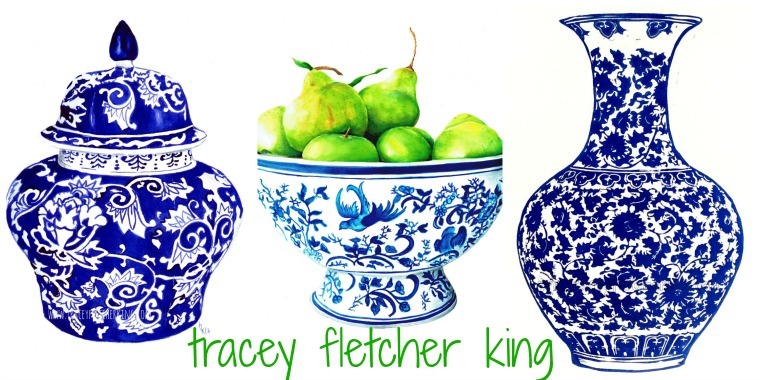 Fabulous illustrations Tracey!! Have a wonderful holiday! Wonderful artwork! I am from the deep south and iced tea is a must! Happy PPF! 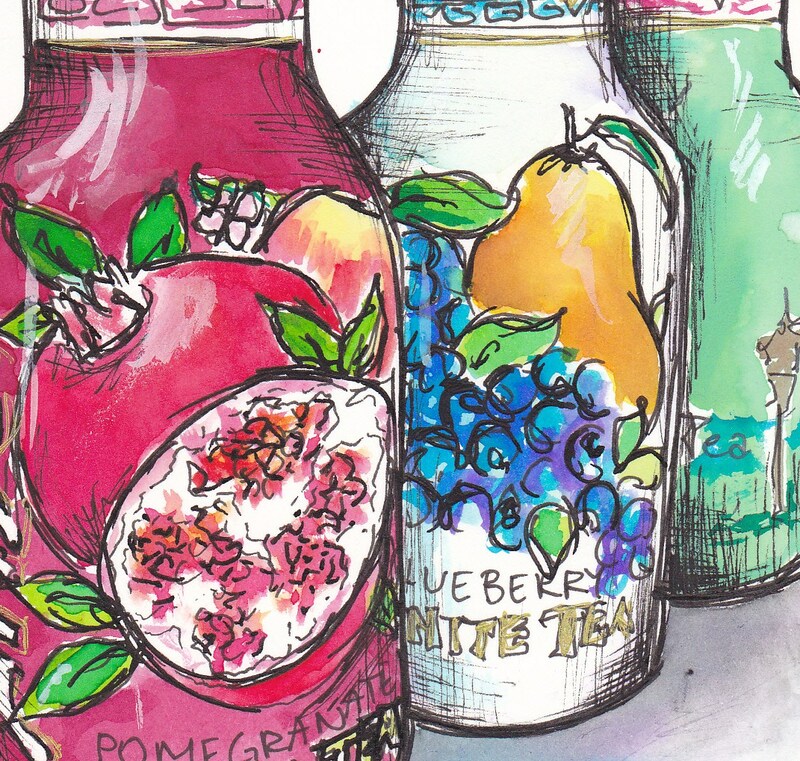 your paint of these teas is wonderful. they really know how to package them attractively. perhaps the company would be interested in your art for their advertising! 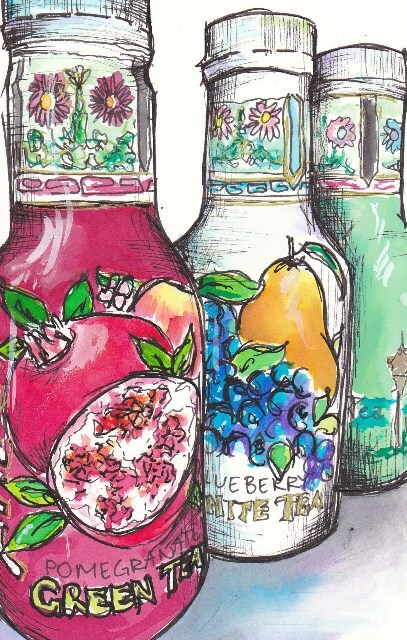 Love your paintings, and these bottles are great! Being a vegetarian, I don't get the correlation between hotdogs and Independence, either. But it was fun to see your lovely red, white, and a bit of blue entry for Jenn's APR challenge this week. I always love how you tie everything to tea. Way to go. Hi Tracey. All your bottles are wonderful. Love what you had to say as well. Your stories are always great. Have a wonderful weekend. By the way, I have about 10 of those Arizona bottles, two in my studio on the window sill. The other 8, I just can't throw away. My husband drinks them. Nice post. Son una preciosidad. Me gustan muchísimo. Realmente lindos, los colores son apasionantes. the bottles are great - the post, cracking me up! hahaha! ben and jerry's is a must! Obviously, your paintings are wonderful--but your writing always makes me smile! I love this juicy colored bottles, they are so very pretty! happy 4th of July! Loving your colorful bottles! Delicious! 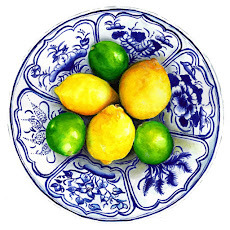 Super-creative still-life to celebrate the Fourth of July!